It's time to catch up on these week-in-review posts! 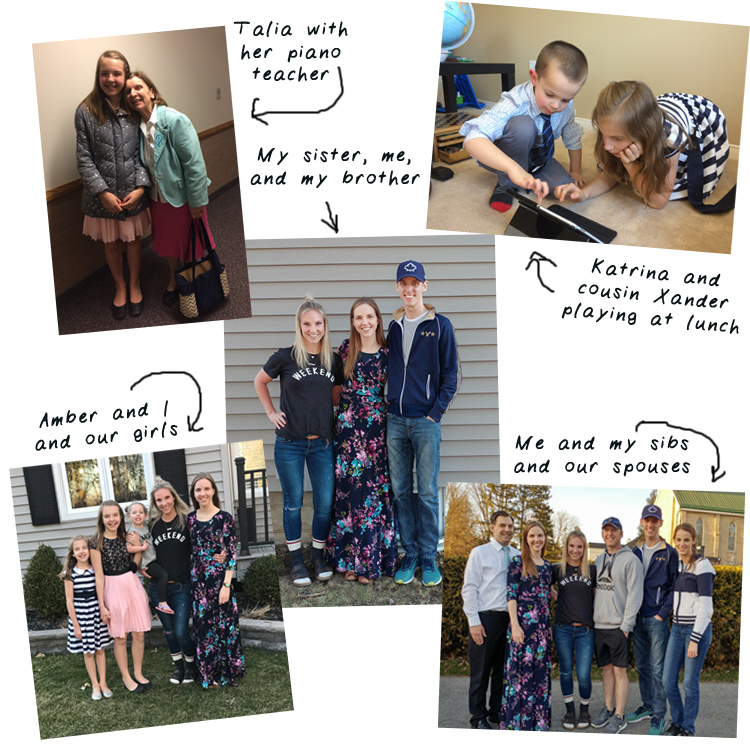 Today's post is all about the week between visiting Utah to find a home, and leaving Canada to move to Utah! Back in Canada, we attended church for the second-to-last time. It was strange to think we would be leaving everyone so soon! After church, we went to Steve & Betsy's house (Ken's brother's family) for lunch. Again, that was weird, just knowing that it would be one of the last times we would hang out with them like that! We went to my sister's house for dinner and hung out with her family and my brother & his wife came too. We grabbed a few photos, to remember the day. Again, it was like it just wouldn't really sink in that it was the last time we'd see each other for a long time! Throughout the week we were so busy, getting things packed and sorted, and making phonecalls to make sure we had everything ready to cross the border, to move to the USA. There were so many calls to make! It seemed like every little thing we had a question about required like 7 different phonecalls to finally get the answer we needed! Meanwhile, the girls attended their last week of school. Talia made a very sweet card for her teacher. She loved her teacher so much this year and I know it was hard for her to leave before the school year was over! 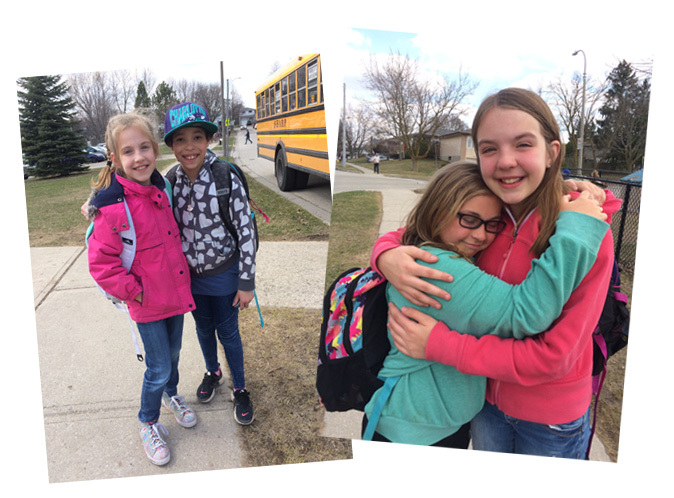 On the last day of school I picked the girls up at the end of the school day and it was a sad time! The girls said goodbye to some of their dearest friends. They attended a school that went from Junior Kindergarten up to grade 6 and Talia was in her final year, having started there in junior kindergarten. My heart ached for her as she said goodbye to one of her best friends- I could feel their pain! Saturday was crazy. In the morning, we had one last moving sale in our house. It went well and again, we made some money to help us with moving costs, so I'm really glad we did it! The rest of the day was spent packing the moving truck with things from the storage unit and our house. It was a LONG and tiring day! That night we parked the truck in Ken's parents' driveway and slept at their house. 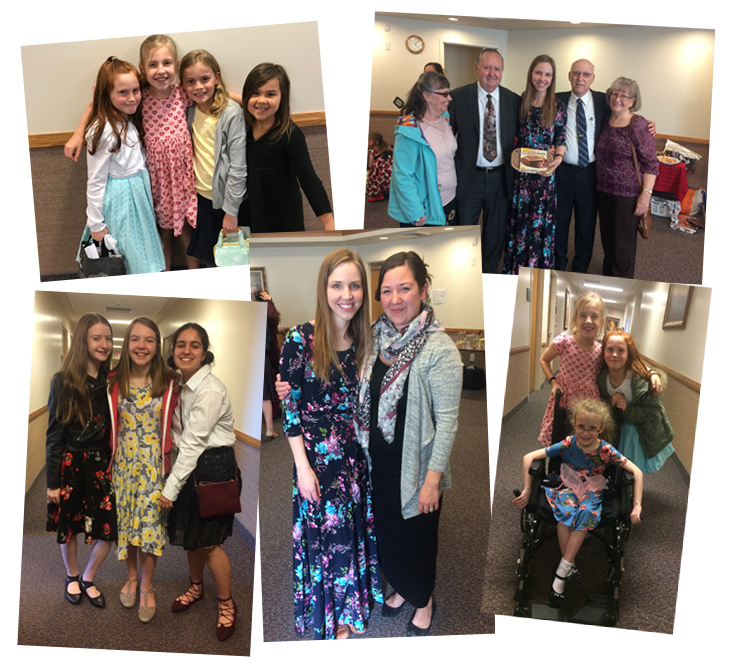 Sunday was a day of farewells. We went to church for the last time and in the evening, my sister-in-law and friend threw a farewell party for our family and another family that is also moving. Here are a few photos from that event. There was a little guest book at the party where people could write a little message to us and we read it during our drive to Utah. Late that night, we finished loading the truck. At this point, Ken's feet and back were in rough shape! His feet had been bothering him ever since our trip to Florida, but he hadn't had any chance to stay off of them to rest them, so they could heal! Whenever his back bothers him, he uses a massage chair back that really helps, so he used that and his mom got a bowl of hot water for him to soak his feet in. Sadly, we forgot to pack that back massager because of that moment, so now he's without it! Monday was supposed to be our moving day but the visas for myself and our girls hadn't arrived yet, so we had to make a change of plans. 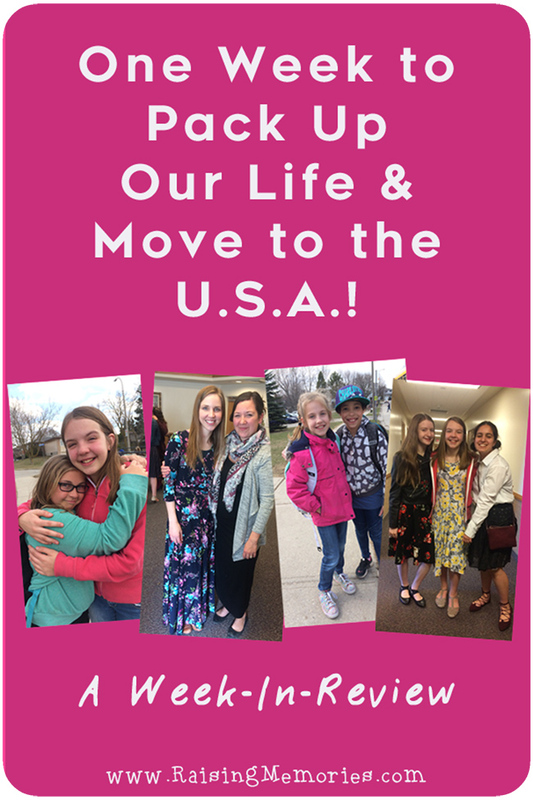 We had a complicated plan for getting our things from Canada to our home in Utah, and the first step was to drive the UHaul truck across the border to a UPack facility in the USA where we would load all of our things from one truck to the other, and the truck would meet us in Utah. Everything was booked for that day, so Ken & his dad drove the UHaul across the border while I stayed home with the girls and ran some last minute errands and got the car packed for the drive out to Utah. The photo below is one that I took, to remind myself how I had packed the car to make everything fit, so that I could re-load it the next morning. By the time we actually left, the trunk was WAY more packed than that because we ended up with much more to try to bring! That day, I found out some discouraging news about our car (it looks like we won't be able to keep it in the USA for more than 6 months to a year). The visas arrived that day as well, so we knew we could leave the next day. I took the girls to say goodbye to "Ggma" (Ken's grandma) and while we were there, Ken showed up and we had a little visit & farewell with her. That was our last week in Canada! My next week-in-review will be the week we spent driving to Utah from Ontario. That is so exciting! My dream is to pack up and move to another city, especially country! I live in the same city, born and raised - and am yearning for a big change and fresh start! Good luck with the move!! There is good in the same town, too, but yes- it has been an adventure for sure! :) and the fresh start is nice :) Thank you Tammi! I have been contemplating this lately. The girls are a big factor in that equation though. So I totally get this. At first I left thinking of course they could go and we could all move. But then I realize technically high school is a big deal and starting a new high school could be a complete PITA and also martial arts and friends and boyfriend for one. UGH. I am confident your beautiful girls will love living in Utah and you must be so excited. They will make friends. They seem like lovely girls. Yes, it's a big change with a lot of ramifications. Thank you Paula! I have loved following your adventure of moving. It is BIG step to make such a big move for a career, and I hope that it works out really well for everyone in the long run. Find the right "fit" for a job in research is not easy. Can't wait to see more about your new adventures in the US. Thank you! It has been a big change so far! I think it will be a good thing for us & Ken is really liking the lab so far, so things are looking good! I'm so excited for you,it's certainly a big change.The girls must be so excited! What a big change! It's so nice that you have settled in!